Unlock your children’s potential by helping them build their strengths. This game-changing book shows us the extraordinary results of focusing on our children’s strengths rather than always trying to correct their weaknesses. Most parents struggle with this shift because they suffer from a negativity bias, thanks to evolutionary development, giving them “strengths-blindness.” By showing us how to throw the “strengths switch,” Lea Waters demonstrates how we can not only help our children build resilience, optimism, and achievement but we can also help inoculate them against today’s pandemic of depression and anxiety. 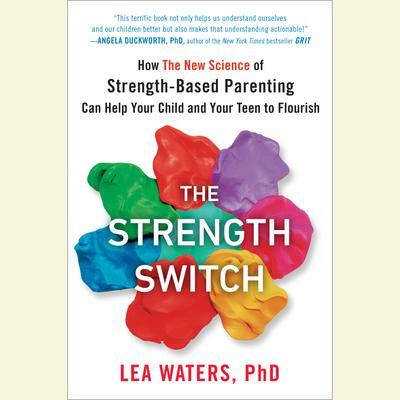 As a strengths-based scientist for more than twenty years, ten of them spent focusing on strengths-based parenting, Waters has seen how this approach enhances self-esteem and energy in both children and teenagers. Yet more on the plus side: parents find it a particularly exciting and rewarding way to raise children. With many suggestions for specific ways to interact with your kids, Waters demonstrates how to discover strengths and talents in our children, how to use positive emotions as a resource, how to build strong brains, and even how to deal with problem behaviors and talk about difficult situations and emotions. As revolutionary yet simple as Mindset and Grit, The Strength Switch will show parents how a small shift can yield enormous results. **Bonus PDF included with exercises and resources related to Strength Parenting.